and show additional information such as fields' names and types. dbfHeaderEdit can't modify fileds or view data in records, cause there's a lot of good software for such purpose. The program needs no installation and can start from any media (HDD, FDD, CD, DVD, USB-flash, etc.). Since version 1.1 you can choose interface language (english or russian). Initial interface language is automatically assigned to operating system default language. In version 1.2 you can fully edit a link to a database file. Table name can be used now as command line parameter. 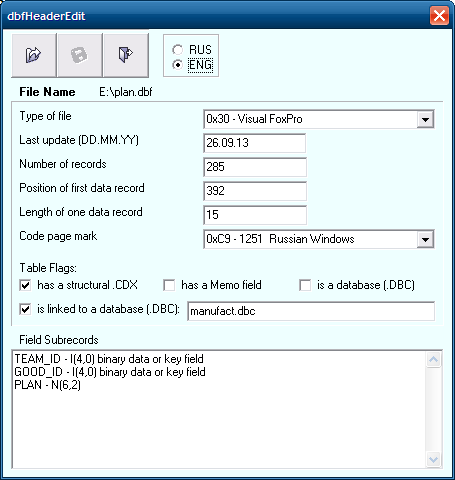 In version 1.3 program checks if the first byte of opened file is a legal indetificator of DBF-table. Also program compares real size of file and size of file evaluated from records size and count. In version 1.4 program calculates count of records when real file size doesn't match its evaluated size. Also fixed some errors. In version 1.5 fixed a few bugs, relating to info about DBC, to field descriptions, to saving files opened from the command line. 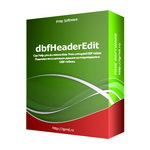 Note: dbfHeaderEdit is initially created for personal needs and has no detailed help information. 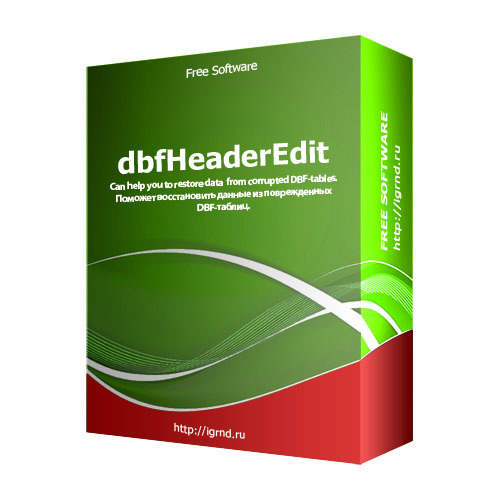 It is desirable to learn more about DBF-structure before use the program.